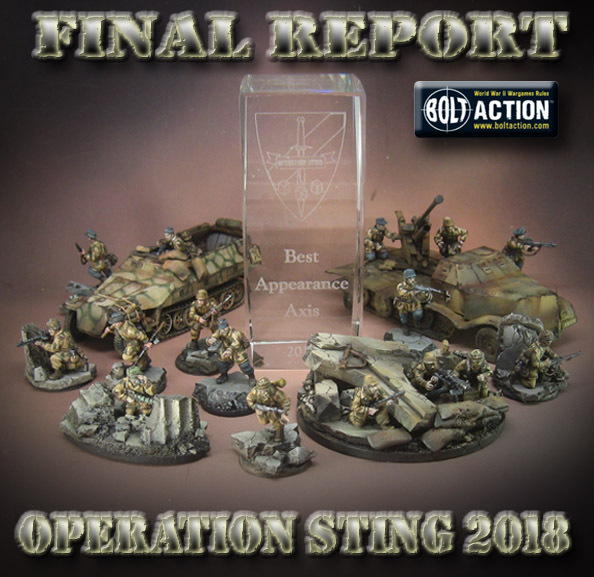 Round 5 of Operation Sting was going to be unlike anything I had experienced before in all the years I had been doing tournaments. When the table assignments were handed out, and I found myself on Table 2... I thought something was miscalculated at first! It was back to fighting Americans once again, this time an Airborne army. So, it would be a fight to the death between paratroopers!!! This also meant that I would be facing the Rangers lead the way effect, and other army specific traits. Also, a double air strike, which we will discuss later. 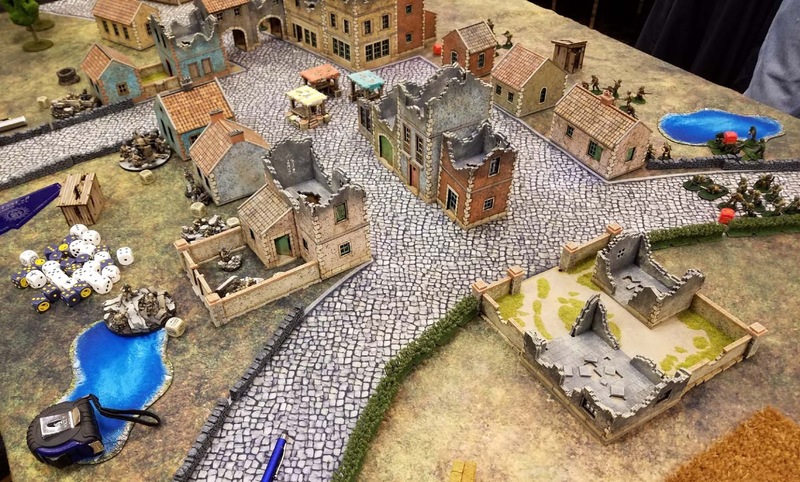 The Airborne troops did indeed try to utilize that pre game movement to get into better positions in and around the village square. 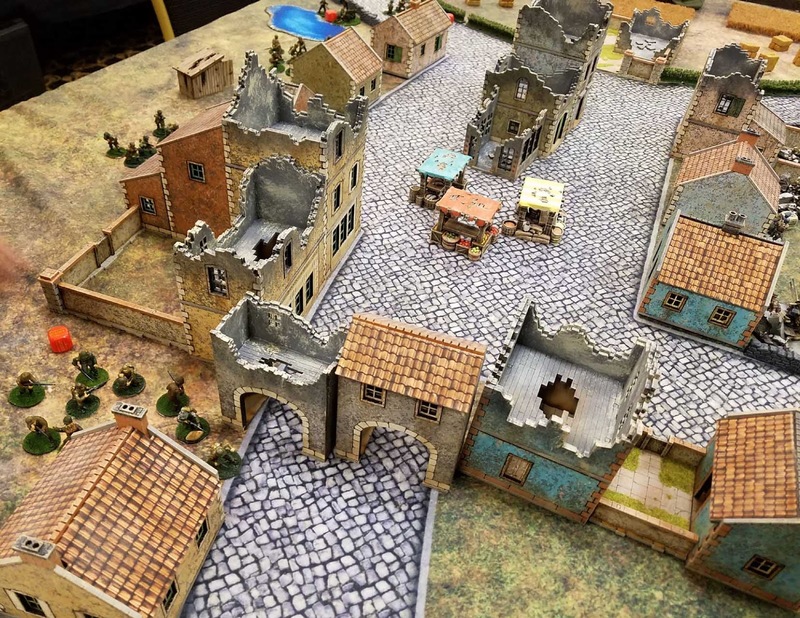 The Fallschirmjager established more of a defensive position, waiting for a potential preliminary bombardment. 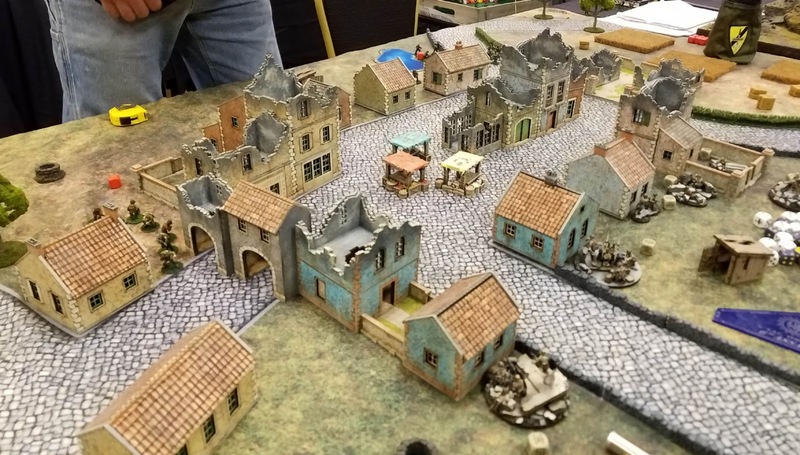 With Paratroops already moved into the buildings in the main square, it forced me to bring in two of the Fallshirmjager units in to combat them... or at least pour in some pinning fire. Things were going very well initially on this flank. The combined firepower of these units, along with a well timed/placed artillery strike caused a LOT of pins and casualties among the US units. It too Captain Spears himself to call on the troops and rally them back into the fight! Here we see the intrepid general overseeing the US forces. At this point, things looked very bleak for the Americans. The only thing that stood in the path of German victory (or at least a draw) was an American air strike. 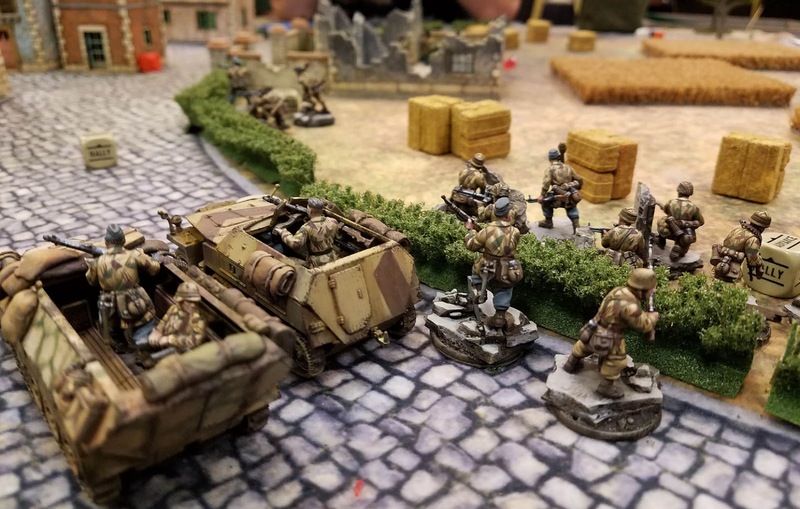 Sadly for the Fallschirmjagers, the angle of attack prevented the transports from adding their defensive fire to the mix. That would spell disaster, because all of my waiting anti aircraft guns missed horribly, and the plane survived! This lead to the destruction of the transports, and pinning the infantry units to ineffectiveness. 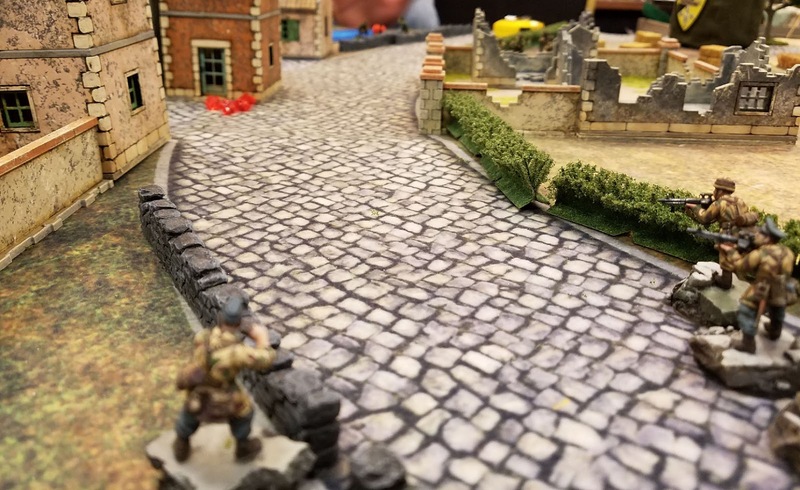 While the last submachine gun squad were lead in a heroic charge by the German officer, killing a few Airborne survivors in the central square, it all came down to one mortar blast on Captain Spears himself. Lo and behold, he would survive, and the US forces would be victorious! 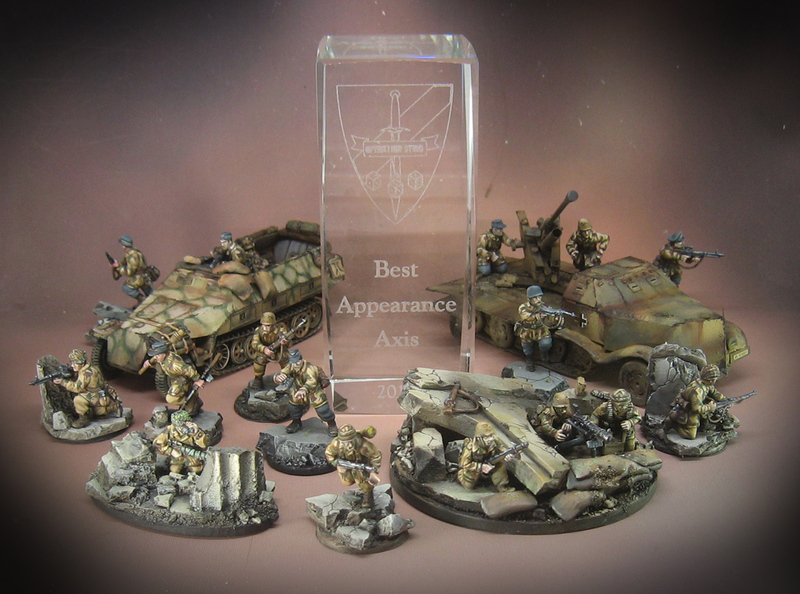 There were a lot of magnificently painted and researched armies at this tournament, which is one of Sting's trademarks. 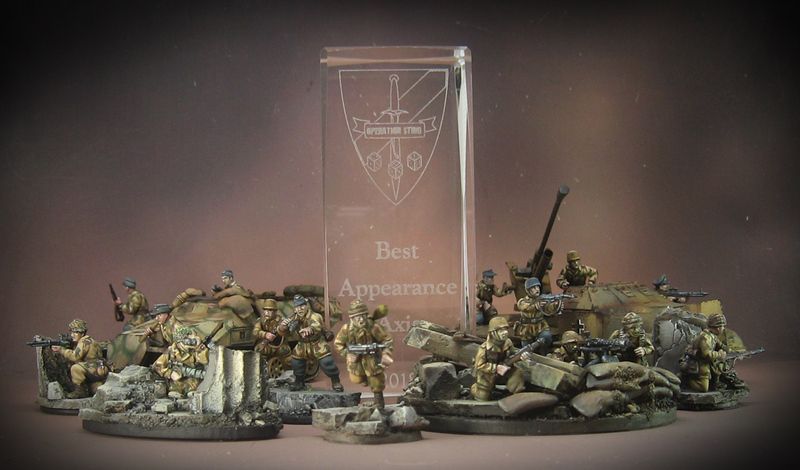 Sportsmanship, terrain, and painting are held to high standards, which made me very happy to be awarded Best Axis Appearance! 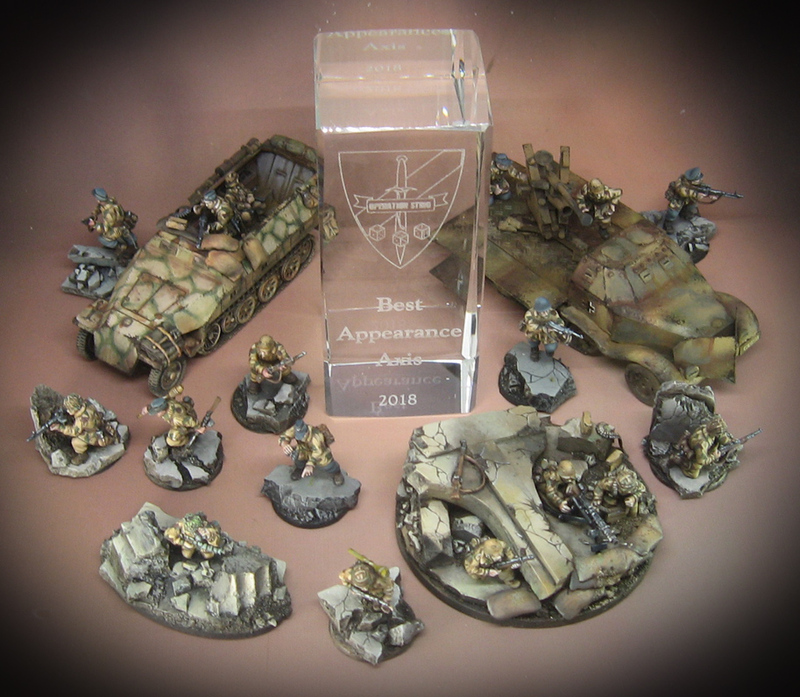 I learned a lot of new techniques painting this army, and building the terrain board. There is a 5 part series that shows how that was created. 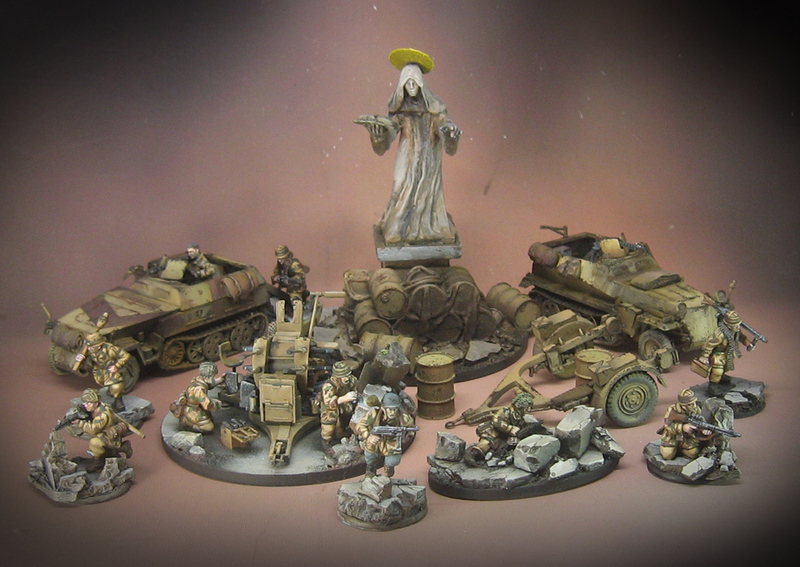 I will also be adding more units to this army, so stay tuned for more articles and painting videos! This made me had to rethink the entire game, as up until now everything I've played has been VERY early war. 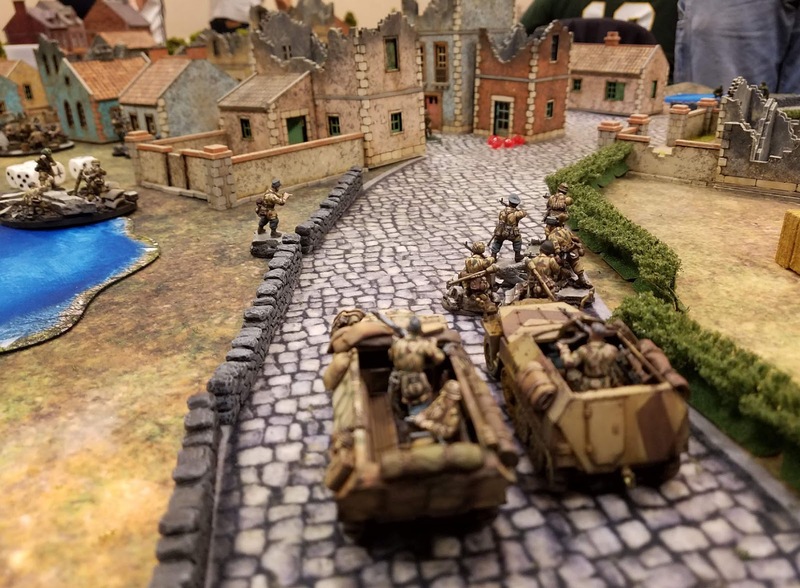 Going from mid 1941 to 1944 was like heading into outer space, and adapting to that kind of weaponry and special rules on the fly was a monster challenge! I mentioned those "soft scores" earlier in regards to painting, sportsmanship, theme, etc. A major part of your overall score was determined by those factors, and I was quite surprised to hear that they had carried me to a 6th place finish out of 29 players! While I had a suspicion that winning that last game might lead to something interesting, I was still very happy to be in the top 10. The effort was really exhausting, to be honest. 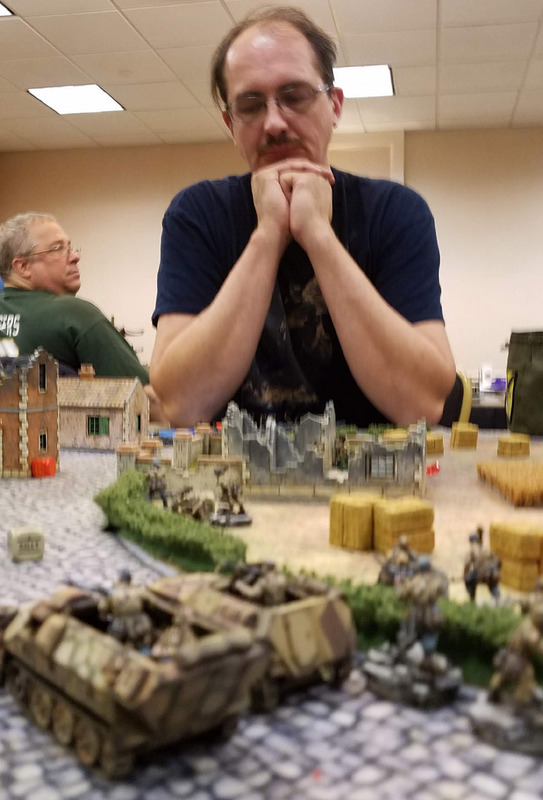 The stress of bringing a totally untested army to a major event like this was heavy on my mind for months leading up to it. The other players at the event made it all worthwhile, as did the equally exhausting efforts of the tournament organizers. Those efforts are much appreciated, and it is an experience that will stay with me for many years to come. Thanks to everyone for a great Operation Sting! !